Grab your hat! It's time to party! Hats of all shapes and sizes take over the stage when a group of milliners help Hatless Hank find the perfect hat. 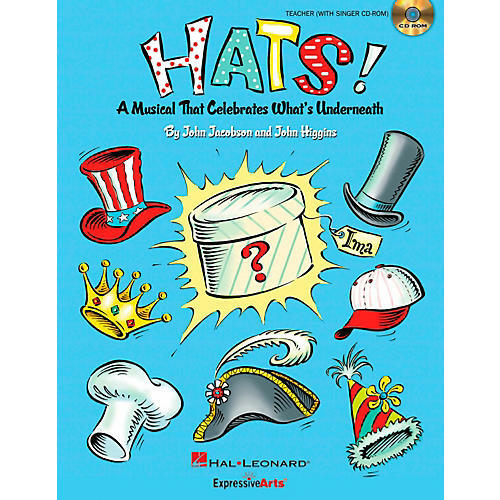 Clever rhyming script and song writing explore all kinds of hats, their uses and the people who wear them. A surprise awaits the audience when Ima Milliner appears in her own remarkable, stupendous, contagious hat of all hats! Discover that it's not the hat that makes a person special, but what's underneath! From hilarious to heart-warming, this 20-minute musical, for young performers in Grades K-3, entertains and educates with five original songs and a script featuring over 30 speaking parts. The enhanced Teacher Edition with Singer CD-ROM includes piano/vocal arrangements with choreography, helpful production guide with staging and costume suggestions, teaching objectives linked to the National Standards for each song, PLUS reproducible singer parts on the enclosed CD-ROM. Available separately: Teacher/SGR CD-ROM, Preview CD, Preview Pak, Performance/Accompaniment CD, and a Classroom Kit with Teacher/Singer and Performance/Accompaniment CD for extra value! Duration: ca. 20 minutes. Suggested for grades K-3. A Musical That Celebrates What's Underneath!